It’s Christmas many years ago, and topping young Hannah Swensen’s wish list is becoming the go-to baker in Lake Eden, Minnesota. But as Hannah finds out, revisiting holiday memories can be murder . . .
With her dream of opening The Cookie Jar taking shape, Hannah’s life matches the hectic December hustle and bustle in Lake Eden—especially when she agrees to help recreate a spectacular Christmas Ball from the past in honor of Essie Granger, an elderly local in hospice care. But instead of poring over decadent dessert recipes for the merry festivities, she instantly becomes enthralled by Essie’s old notebooks and the tale of a woman escaping danger on the streets of New York. Hannah’s surprised by Essie’s secret talent for penning crime fiction. She’s even more surprised when the story turns real. 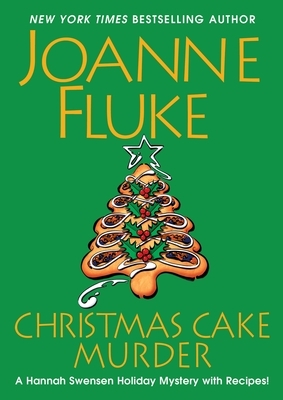 As Hannah prepares to run a bakery and move out of her mother’s house, it’ll be a true miracle if she can prevent another Yuletide disaster by solving a mystery as dense as a Christmas fruitcake . . .
JOANNE FLUKE is the New York Times bestselling author of the Hannah Swensen mysteries, which include Raspberry Danish Murder, Banana Cream Pie Murder, Wedding Cake Murder, and the book that started it all, Chocolate Chip Cookie Murder. That first installment in the series premiered as Murder, She Baked: A Chocolate Chip Cookie Mystery on the Hallmark Movies & Mysteries Channel. Like Hannah Swensen, Joanne Fluke was born and raised in a small town in rural Minnesota, but now lives in Southern California. Please visit her online at www.JoanneFluke.com. INDULGE IN JOANNE FLUKE’S CRIMINALLY DELICIOUS HANNAH SWENSEN MYSTERIES!